The Beumer Group announced that it has reengineered the high capacity layer palletizer, Beumer paletpac 2500, for accessibility, shorter assembly period and higher flexibility. The Beumer paletpac layer palletizer series stack bags filled with bulk material on pallets gently layer by layer. The products include cement, mortar, pellets, industrial salts and fertilizers filled in paper, polyethylene (PE) or polypropylene (PP) bags. The geometric precision during layer and stack formation forms stable bag stacks. Multiple pallet loads created with the Beumer paletpac can even be stacked one on top of the other to save storage space. According to the company, the Beumer paletpac 2500 is redesigned so that it now achieves a lower production costs which is reflected in the purchase price. It also brings a reduction in operating costs. In order to optimize the energy consumption in the new Beumer paletpac, the company exchanged the lifting frame for four chains with a counterweight. This saves considerable weight thus minimizing the energy needed for the lifting movement. The pallet is now pulled up by the chains. Previously, a large hoist drive was needed for the system, but now a small motor operating as a servo drive is sufficient. It results in further weight reduction, less maintenance and lower costs for the user. And when maintenance or cleaning is in order, all the components can be accessed easily. Beumer has also made the overall structure of the Beumer paletpac considerably slimmer. Their design engineers were able to save around 2.4 tons of material. Among other things, they have downsized the massive frame of the palletizer head. The redesign saves material costs and provides the user better access to the machine. Another important modification is that the external frame elements can now be folded, according to Beumer. In this way, the whole palletizer head fits into one transport container. 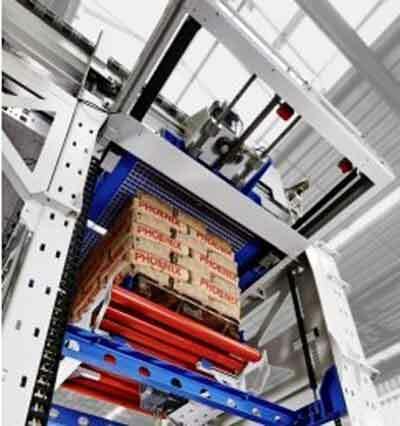 The palletizer head doesn’t have to be dismounted, and the total amount of containers sent to the user can be reduced. It alleviates the transportation costs and shortens the assembly period on site. The pallet pusher that automatically provides the hoist unit with empty pallets has also been modified by Beumer. The guides for the pallet side plate have been modified and a new lateral guide system is introduced, changing the drive performance and decreased the system width. Now the user can quickly and easily adapt the palletizer to different pallet sizes without the use of tools. The Beumer paletpac palletizes bags up to a pack height of 2,400mm, in all technically possible packing patterns and on any commonly used pallet size, including intermediate sizes such as 1,400 x 1,200mm. A multi-program enables the user to set parameters easily and quickly. The Beumer paletpac can also be provided with a bar-type turning device or with a newly developed twin-belt turning device to position the filled bags quickly, ensuring their dimensional stability.